I tend to push a lot of buttons when this topic comes up, but I stand by my opinion: Scheduling tweets is bad news. For the same reason you wouldn’t schedule your emails to go out in advance. You have no idea what may happen between the time you compose a message, and the time it is sent out. And Twitter is broadcasted to the entire world, not just who is listed in the “To” line! And to take it a step further, Twitter is all about the interaction and connections you create. If you’re too busy to hit the send button on Twitter, then you’re also probably too busy to be fostering any type interaction. So seriously, stop it. But don’t take my word for it. Here are some catalysts to get the conversation going. Worst Scheduled Tweet Timing. Ever. By Scott Stratten of UnMarketing. By the way – check out his podcast. It rocks. From The Huffington Post. This is awful, and the social media blunder was 100% preventable had someone been more on top of their game. From FastCompany, for an objective piece that sees both sides of the argument. I love their findings: “After a six-month experiment, my belief is you can automate content, but you can’t automate connection. ” Bingo. 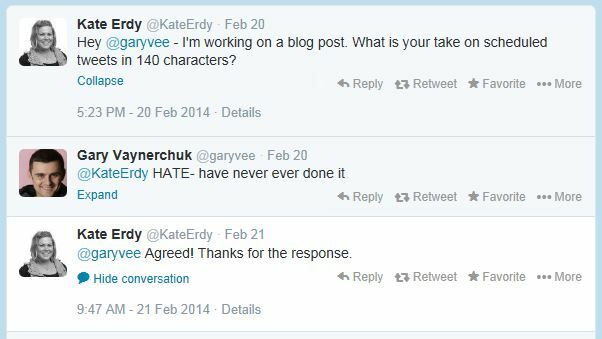 And last but not least, because Gary Vaynerchuk says so. I will say this: I sometimes store ideas for future tweets in the “scheduled tweets” column of Hootsuite. But I “schedule” it for 2020 so there is no chance in hell that it will go out without me manually sending it. I’m just sayin’ – if you’re too busy to send your own tweets, maybe Twitter isn’t for you. #EndRant. I just started using Hootsuite and have tried the autoscheduling tweet tool with some good success (i.e. retweets). I can see how the autoschedule tool can cause problems when your tweets are topical but mine usually are just quotes and what not. Also with many of my followers follow up to 10’s of thousands of people I am hoping the autoschedule gives them a better chance of seeing my tweet. But how about if you come across a number of different pieces of interesting content and you schedule them as tweets which are spaced out over hours or days, so that you don’t clog up your followers’ feeds? I use scheduled tweets like this. It also keeps my account active while I am working on involved pieces projects.